You’ve been at this for a while now and so you’re ready to grow your freelance business. You’ve achieved the goals you set yourself when you first started and now it’s time to aim a little higher. But where should you start when you want to take your business to the next level? Have you revised your portfolio lately? As a newbie, you likely took on a wide range of projects in a bid to develop a portfolio and start earning a living. There’s nothing wrong with that – that’s the way most freelancers get started. But now that you’ve been in the game awhile, it’s time to reconsider the impression your portfolio gives. Have you updated it recently? Does it show your best work? Are the pieces relevant to the industry you’re targeting? Scrap older pieces that don’t fit your target market. Focus on adding recent, relevant pieces that show off your skills. Grow your freelance business and maintain a good work-life balance by bringing in outside help. Hire a freelancer to take care of the things you’re not so good at. That way, you’ll have more time to focus on the things you are good at. Join a freelancer network to meet others you can build working relationships with. You’ll find plenty online and there may be some in your local area, too. Facebook groups and Twitter chats are an excellent way to meet new people, especially if you’re short on time or find face-to-face networking daunting. I run #ElyHour, a weekly Twitter chat that helps freelancers, small business owners and local charities connect, support each other and share their latest news. If you’re local to Ely, join us on Twitter. You might just meet your new business partner there. Are you looking to hire someone outright or do you want to negotiate a skill-swap? Either way, you’ll find all level of freelancers out there who are in a similar situation to you. It would also be wise to consider entering partnerships with other freelancers. When others are offering complimentary services and targeting similar clients, it makes sense for them to team up. Can you help each other get work? Can you work on projects together? Can you set up a referral scheme? When you start out, it’s common that a lack of confidence can hold you back from applying for the projects you want. You may feel that you don’t have enough experience or the necessary skills to handle such projects. As time goes on and you build on your experience and skills, your confidence levels should rise and you should come to believe in your own abilities more. When this happens, it’s a good sign that you’re ready to grow your freelance business. Take a step back and consider the projects you’re currently getting. Compare them to your dream projects and then weigh up what’s missing. Are you close, or do you still have a way to go? Do you need to develop your skills? Are you on the right tracks, or do you need a change of direction? Is it time to adjust your focus and re-brand? From there, you should be able to develop a plan for targeting your ideal clients and taking on longer and/or bigger projects. Have you picked up some new skills along the way that you can start to offer as a service? Adding to your offerings could be a good way of both enticing new clients and developing stronger relationships with your existing clients. The more you can do for a client, the easier you make it for them to come to you with extra work. Maybe you’re a virtual assistant who runs her own blog? Can you offer blogging or WordPress uploading as an extra service? Maybe you’re a graphic designer and you’re also great at copywriting? Can you offer the graphics and text for new website designs? Is there something you’re interested in that you’d love to learn more about? Then pursue it. Find a course and learn a new skill, but do so with a business mentality. Consider first how you will incorporate this new skill into your existing business. Will it help you grow your freelance business? Does it relate to your current services? Is it something your clients need? How could you tie it in with what you’re already offering? Worried you don’t have the time? Get organised and learn to prioritise your workload so that you can use your time more effectively. When you’ve gained experienced and skills and/or added value to your services, increasing your fees is a fair and natural step. You don’t need to have a reason, but you should always tell your clients in advance. In case your clients ask why your prices are going up, it might be a good idea to have an answer prepared. Avoid talking about your personal financial situation and instead focus on the added value the client now receives. For example, if you’ve developed your skills, talk about how you can now provide a more effective service. Remember, there doesn’t have to be a reason and you shouldn’t have to explain your decision to anyone. But, if you want to keep your existing clients, then it’s important you find a smart way to introduce your new rates to them. 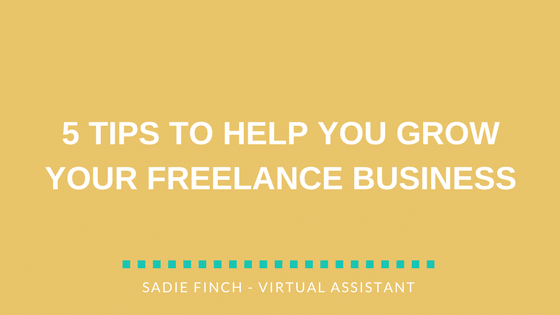 If you’re ready to grow your freelance business and need help taking those first steps, take a look at the many services I offer as a freelance virtual assistant. I’d be thrilled to help you level up your biz.